Here’s a sneak peek of our upcoming house-made jewelry line! We specialize in creating custom jewelry individually for clients, but that doesn’t stop us from creating our own jewelry when the inspiration strikes. Often it starts with a beautiful gemstone or diamond that we can’t pass up, then we design a ring around it that complements the best features of that stone. So recently we had the opportunity to work with some beautiful rose cut diamonds and took it! 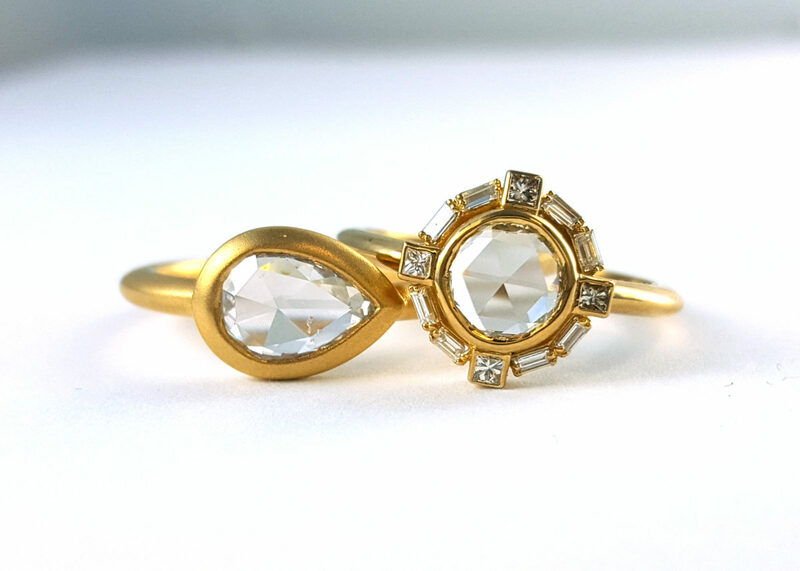 This particular diamond cut has recently gained in popularity, but it is actually considered an antique cut. They can be dated back to as early as 1500, and were the original diamond cut before today’s brilliant cuts gained in popularity around 1900. 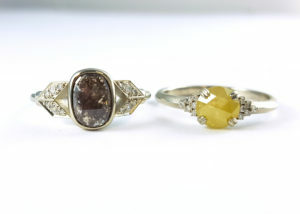 We love vintage touches and are so excited to be designing around these old-world fashioned cuts. Rose cuts are flat on the bottom and rounded on the top, giving them a lower profile and larger surface area compared to current brilliant cuts. This design tends to fit into the modern lifestyle, it doesn’t have to sit high above your finger and therefore won’t catch as easily with simple gestures like putting your hands in your pockets or when putting on gloves. Also, since they are flat on the bottom, you get more diameter per carat to enjoy the diamond’s brilliance! Our favorite feature of rose-cuts are their unique grid-like triangular facets and geometric lines. So they look great paired with art-deco inspired designs. They make great engagement rings because their triangular facets resemble rose petals (appropriately named). Wearing a rose cut engagement ring is like having a rose wrapped around your finger. The rose cut diamonds also give off a vintage vibe even in a modern bezel setting. We’ve set many of the colored and rustic rose cut diamonds in bezels, which showcases their natural charm and multi dimensional qualities. Bezel setting is also ideal if you are looking for a low-profile with style.